Qualcomm has unveiled its next generation SoC for high end smartphones, the Snapdragon 835. 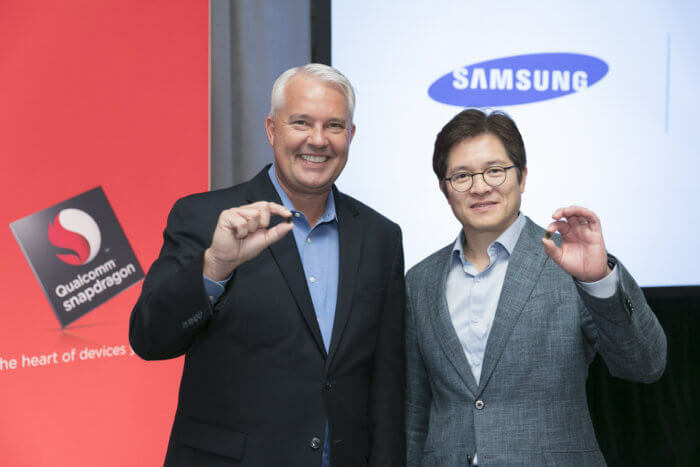 Built in collaboration with Samsung using its new 10-nanometer FinFET process, the chip promises to improve performance and energy over the Snapdragon 820 and 821’s 14nm FinFE, and is set to land in devices at some point during the first half of next year. The new design promises a 27% increase in performance while using 40% less power than its predecessor, which should translate into better battery life. The Snapdragon 835 will also allow smartphones to charge faster thanks to the introduction of Quick Charge 4, which supposedly can offer 20% faster charge times and deliver up to 5 hours of battery life in only 5 minutes of charging. That’s certainly an impressive claim that we’ll have to put to the test ourselves. Qualcomm is making this claim based on internal testing on a 2750mAh battery. Quick Charge 4 comes with advanced safety features for both the adapter and mobile device. Protection is implemented at multiple levels and throughout the entire charging process to more accurately measure voltage, current, and temperature while protecting the battery, system, cables and connectors. An additional layer of protection is also being added to help prevent battery over-charging and regulate current throughout every charge cycle. Qualcomm didn’t mention any device partners but likely candidates include include Samsung's upcoming flagship handsets like the Galaxy S8. The Snapdragon 820 and 821 are used in devices like the Samsung Galaxy S7, LG G5, and HTC 10, and Lenovo Phab 2 Pro.